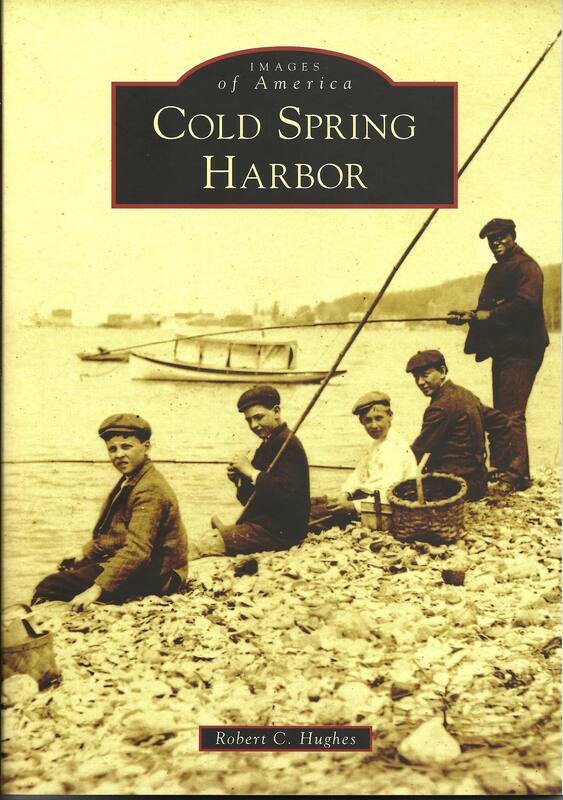 I have completed a book on Cold Spring Harbor for Arcadia Publishing’s Images of America series. The book is available at Book Revue and local stores in Cold Spring Harbor as well as online at http://www.arcadiapublishing.com/9781467122245/Cold-Spring-Harbor. Below is the introduction to the book. Water is the defining characteristic of this place now called Cold Spring Harbor. To the indigenous inhabitants it was known as Wawepex, or “at the good little water place.” The European settlers of the seventeenth century named the area after its abundance of fresh water springs. The word “harbor” was added in 1826 to avoid confusion with the town of the same name on the Hudson River (throughout the nineteenth century, most locals continued to use the two word name). The name reflects the essential role water, both fresh and salt, has played in the area’s history. The fresh water springs provided drinking water. The stream flowing from the south provided power for local mills. The harbor provided an outlet for trade up and down the eastern seaboard and a starting point for whaling voyages to the far side of the globe. Even the most disinterested resident knows that Cold Spring Harbor was a whaling port. But Cold Spring Harbor’s whaling period was relatively brief, lasting just over a quarter century from 1836 to 1862. There is far more to Cold Spring Harbor than whaling. Cold Spring Harbor has been inhabited for thousands of years. Unfortunately, other than some arrowheads, tools made from animal bone, hide scrappers, and pottery shards, little evidence of pre-European settlement survives. For that matter much of the early European settlement is also unknown. The community is a hamlet within the Town of Huntington and was the western edge of Huntington’s First Purchase in 1653. Within ten years of the First Purchase, at least three permanent homes had been established in Cold Spring Harbor: Jonathan Rogers log house on the east side of what is now Harbor Road about a half mile south of the head of the harbor, the Rudyard house on the north side of Main Street just before the intersection with Goose Hill Road, and the Titus house on the east side of Goose Hill Road across from what is now Titus Lane. As farms became established, the need for a mill to grind grain was recognized. In order to avoid the need to bring their grain to mills in either Huntington or Oyster Bay to be ground, permission was sought to build a gristmill in Cold Spring Harbor. After two unsuccessful attempts by others, John Adams in 1682 built a dam across the Cold Spring River, an impressive name for the small stream that runs north through the valley from the present site of the rail road station to the harbor. On this dam Adams built both a gristmill and sawmill. The gristmill was not successful; the sawmill was. In 1700, Benjamin Hawxhurst built a woolen mill near the present site of the Fish Hatchery. Later in the early nineteenth century, the Jones family operated two very successful woolen mills. The upper woolen mill was located upstream on the site of the 1682 mills at the southeast end of St. John’s Pond. This mill was for weaving. The lower mill was located on the southwest side of the harbor near the entrance to the Cold Spring Harbor Laboratory property. The lower mill was powered by water fed to the site by means of a wooden pipe carried over the road on a trestle from a small pond on the south side of the highway and part way up the hill. The lower mill was used for spinning. Together the two woolen mills produced broadcloth, blankets, and coverlets. Starting in the 1870s, the upper mill was used by George W. Earle as a sawmill and organ factory. In 1782, Richard Conklin built a paper mill near the intersection of Main Street and Shore Road. Finally, in 1791, the Hewlett family built a gristmill on the east side of the harbor about a quarter of a mile from the head of the harbor. This mill was powered by water from St. John’s pond that ran through a canal between the road and the harbor. The mill burned down in 1921, but traces of the canal can still be seen today. Cold Spring Harbor was made a Port of Delivery by an Act of Congress on March 2, 1799. As a Port of Delivery, a Surveyor of Customs was appointed, who had the “power to enroll and license vessels to be employed in the coasting trade and fisheries, and to enter and clear, and grant registers and other usual papers to vessels employed in the whale fisheries.” When Customs Districts were reorganized in 1913, the Cold Spring Harbor office was abolished. Coastal trading was a thriving activity into the early twentieth century. Small shipyards produced the schooners needed to transport goods not only from Cold Spring Harbor to New York City, but up and down the east coast, to the West Indies and beyond. In the 1840s typical cargo would include rice, sugar, cigars, logwood, mahogany, coffee, palm oil, and ivory. In later years, coal, sand and gravel were typical cargos. An indication of the scope of coastal trading is the fact that in 1883 99 ships were registered from Cold Spring Harbor. The woolen mills and gristmill were two of the enterprises run by the Jones family. The gristmill came into the Jones family through the marriage of John Jones to Hannah Hewlett. The five sons of John and Elizabeth Jones—especially John H. Jones and Walter Restored Jones—were the leading entrepreneurs in Cold Spring Harbor’s early history. In addition to their mills, they operated a general store near the gristmill, a shipyard on the east side of the harbor, and a barrel factory on the west side of the harbor. The bungs used as stoppers on the barrels gave rise to the name Bungtown. In order to get their various products to market, in 1827, brothers John and Walter R. Jones incorporated the Cold Spring Steam Boat Company, built a dock on the east side of the harbor and later procured the steamboat American Eagle to transport their goods to the New York market. By the 1830s, foreign competition had undermined the profitability of the woolen business. In 1836, the brothers decided to expand their business ventures to include whaling. At first they personally owned the whaling ships, later they incorporated along with other prominent Cold Spring, Huntington, and Oyster Bay citizens. From 1836 to 1862, nine ships sailed from Cold Spring Harbor on voyages lasting up to two years. Woolens from the local mills, barrels from Bungtown, produce and meat from local farms, and other local products were used to outfit the ships for their months long journeys to as far as Alaska. The venture was successful, but the death of John Hewlett Jones in 1859 and of Walter Restored Jones in 1855 as well as the discovery of petroleum in Pennsylvania in 1859 led to the inevitable demise of Cold Spring Harbor’s small whaling industry. The economic activity spurred by the whaling ventures was soon replaced by tourism—still a mainstay of the local economy. At the same time, shipyards, a marine salvage yard, sail makers, and blacksmiths continued Cold Spring Harbor’s industrial traditions. World famous panorama artist John Banvard settled in Cold Spring Harbor in 1852. Banvard made a fortune exhibiting his half mile long painting of the Mississippi River. Audiences would be seated in a specially built auditorium while canvases on either side of the room were advanced from one scroll to another to give the illusion of floating down the river. After a successful European tour, which included a private viewing for Queen Victoria, he built a castle-like home reportedly inspired by Winsor Castle and named it Glenada in honor of his daughter Ada. The home was later converted into a luxurious summer resort hotel, which was joined by two others, Forest Lawn next to the Glenada and Laurelton, on the west side of the harbor. Less wealthy visitors could stay at Van Ausdall’s hotel. Day-trippers took steamboats out from New York City by the thousands to visit local picnic groves along the harbor’s shores. Some wealthy New Yorkers built homes of their own overlooking the harbor. In the decades before the turn of the twentieth century, the old factory buildings on the west side of the harbor were put to new uses. First in 1883, New York State saw the advantages of the area’s fresh water springs to operate a fish hatchery to raise fish to stock local lakes and rivers. A few years later, the Brooklyn Institute of Arts and Sciences established a field station on the harbor’s western shore. That small field station has now grown into one of the leading genetics institutions in the world. Close proximity to New York City, of course, meant that suburbanization was inevitable. The trend began slowly in the 1920s, but was temporarily halted by the Great Depression of the 1930s. It resumed in full force after World War II. This explosive growth not only in Cold Spring Harbor but throughout the Town of Huntington led directly to the establishment of one of the community’s most distinctive assets today—its school system. Originally four separate local school districts, students who wished to continue with high school, attended Huntington High School until 1958. When that district stopped accepting out of district residents, the local districts banded together and built their own high school, now one of the top rated schools in the country.